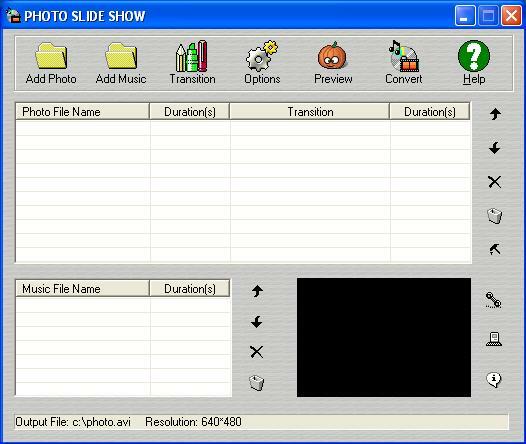 Photo Slide Show is an easy tool to convert digital photos to photo slide show and create stunning photo slide shows with transition effects. Photo slide show includes below main features: Convert digital photo and music collection to AVI file Provide dozens of transition effects Photo slide show support photo format BMP JPEG GIF TGA Support audio farmat MP3 WAV WMA MPA MP2 AU AIF AIFF SND Photo Slide Show also use open compression system for video and audio Output avi video file with higher resolution than DVD Real-time preview slide show. Support multilanguage. Support to output wmv mkv asf if extra codec is installed.